Wicked Broadway Musical grossed $1,735,066 and had an attendance rate of 97.3%, about 2.0% less than that of the previous week. The 31 shows on the boards grossed $24,616,128, improving around 0.89% from the previous week’s totals. Willemijn Verkaik, the current Elphaba in Wicked Broadway will play her final performance at Gershwin Theatre on May 26. Lindsay Mendez will take over the role beginning May 28. Lindsay Mendez made her Broadway debut as Jan in the 2007 revival of Grease. She then appeared in Everyday Rapture with Sherie Rene Scott before breaking out as the “Bless the Lord” soloist in the 2011 revival of Schwartz’s Godspell. Her off-Broadway credits include originating the role of Rose in Dogfight (Outer Critics Circle Award nomination), Everyday Rapture and The Marvelous Wonderettes. Mendez also appeared in concert and on the recording of Ryan Scott Oliver’s 35mm: A Musical Exhibition. Mendez has previously worked with both the composer and director of Wicked, having appeared in the 2011 Broadway revival of Stephen Schwartz’s Godspell, and, more recently, giving a breakout performance in the world premiere musical, Dogfight, staged by Wicked director Joe Mantello. She joins the Wicked Broadway cast that currently includes Katie Rose Clarke as Glinda, Kyle Dean Massey as Fiyero, Randy Danson as Madame Morrible, Adam Grupper as The Wizard, Catherine Charlebois as Nessarose, F. Michael Haynie as Boq and John Schiappa as Dr. Dillamond. Wicked is a sanding production on Broadway at Gershwin Theatre – 222 West 51st St, New York, NY 10019. Buy Wicked Broadway Tickets Online, SAVE $10 on ALL ORDERS of $350+, Use code: TICK13 at Checkout! Wicked National Tour will be returning to Salt Lake City Utah as a part of the Broadway Across America Utah 2013-14 season. Wicked, the smash musical that tells the backstory of Glinda the Good Witch and Elphaba before L. Frank Baum’s “The Wonderful Wizard of Oz.” Lines formed days in advance of tickets going on sale for the musical’s appearance last year in Salt Lake City, with every show sold out. Don’t miss the return of Wicked to Salt Lake City, coming to the Capitol Theatre July 9 – August 24, 2014 as a special to the Broadway Across America – Utah 2013-2014 Season! Get your tickets to the return of what the New York Times calls “Broadway’s Biggest Blockbuster”! Wicked national tour currently stops at Kalamazoo MI for only 2-weeks from April 24 through May 5. “I always thought of myself as a dancer who could sing. At that moment, I heard ‘Defying Gravity’ and I was like, ‘Oh my goodness, this is amazing. This role is the biggest, the best female role you could play,’” she said. A decade later, DiNoia is portraying Elphaba all over the world, including when the tour stops at Kalamazoo’s Miller Auditorium from April 24 through May 5. DiNoia is the one of several Elphabas to follow 2004 Tony Award-winner Idina Menzel’s portrayal. DiNoia said it’s a challenge to live up to Menzel. “It gets a little difficult when people start writing things about you online, but I try to stay away from much of it as I can, because I don’t want to get into my head what people think. I want to stay true to who I am. Obviously, I’ve learned from other Elphabas, but I like to make it my own at the same time. I’m proud of that,” she said. DiNoia has been with the production for seven years, she said. 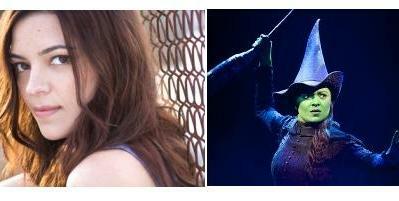 She’s played Elphaba in Broadway, Chicago, Australia and South Korea companies. This is her first turn playing Elphaba as the lead. This tour finds DiNoia paying especially close attention to her health, she said. “I’m definitely super cautious about everything I do with my voice and everything. I’m drinking more tea and definitely trying to stay quiet when I’m not at the show, the vocal rest kind of thing. I’m trying to stay healthy and take my multi-vitamins,” she said. As a part of the Broadway San Jose 2013-2014 season, Wicked will play August 27 to September 14, 2014 at San Jose Center For The Performing Arts in San Jose, CA. Based on the novel by Gregory Maguire, Wicked imagines a pre-Dorothy backstory for the Wicked Witch of the West, Glinda the Good and several other characters familiar from L. Frank Baum’s original and the 1939 MGM film. Long before Dorothy drops in, two other girls meet in the Land of Oz. One – born with emerald-green skin – is sMart, fiery and misunderstood. The other is beautiful, ambitious and very popular. WICKED tells the story of their reMaykable odyssey, and how these two unlikely friends grow to become the Wicked Witch of the West and Glinda the Good. Wicked will be at San Jose Center For The Performing Arts through September 14, 2014. Buy Wicked San Jose CA Tickets Online at discounted prices. Wicked Broadway musical still in the $2 Million Club with the grossing $2,257,034 and had an attendance rate of 98.7%, about 1.3% less than that of the previous week. The 32 shows on the boards grossed $25,899,689, slipping around 7.37% from the previous week’s totals.